Africa is a cruel country; it takes your heart and grinds it into powdered stone – and no one minds. 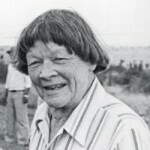 Elspeth Joscelin Huxley was a Kenyan writer. She wrote 30 books, including her best-known lyrical books, The Flame Trees of Thika and The Mottled Lizard, based on her youth in a coffee farm in British Kenya. She left Africa in 1925, earning a degree in agriculture at Reading University in England and studying at Cornell University in upstate New York. During the Second World War, she was a broadcaster for the BBC. In 1960, she was appointed an independent member of the Advisory Commission for the Review of the Constitution of the Federation of Rhodesia and Nyasaland. In the 1960s, she served as a correspondent for the National Review magazine. Huxley's 1939 book Red Strangers describes life among the Kikuyu of Kenya around the time of the arrival of the first European settlers.